Horndean have been handed a tough trip to Isthmian League premier division outfit Margate in the first-qualifying round of the FA Cup. 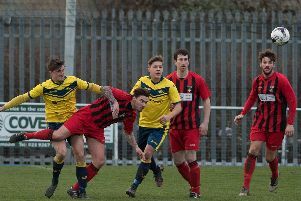 Michael Birmingham’s side defeated Ascot United 3-0 on Saturday to set up the tie. Meanwhile, Gosport Borough are also on their travels. Craig McAllister’s troops visit Sittingbourne, from the Isthmian League south-east division. Moneyfields and Bognor also face opponents in the same division. Dave Carter’s Moneys host Thamesmead Town, while the Rocks go to Whitstable Town. Ties will be played on Saturday, September 8.